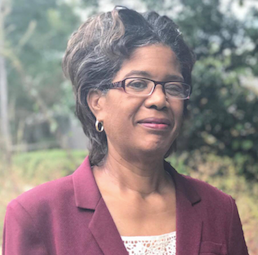 It has been several years since I tried finding ancestors on GenealogyBank.com, but I just recently was surprised to come across My Folder as well as a couple of articles I had never seen before. It prompted me to start a new subscription, and do some searching. In My Folder, I have saved three different types of searches. One is called “Saved Articles.” These are articles I saved to move to a more permanent place because they tell me about an ancestor. 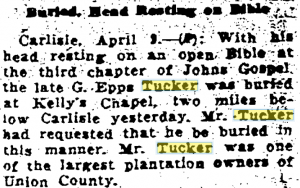 I also have searches that I need to go through to make sure my ancestor is mentioned. These put in the “Saved Searches” section. I will not have to search, but come into My Folder to access it. There is a last tab in My Folder for “Recent Searches,” however, I will probably use the first two. If you know what you would use this search for, let us know on the Facebook Group post for this article. 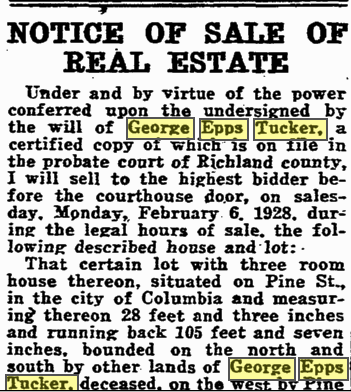 I was really glad to have found two obituaries and one sale of property during the time of the death of George Epps Tucker. 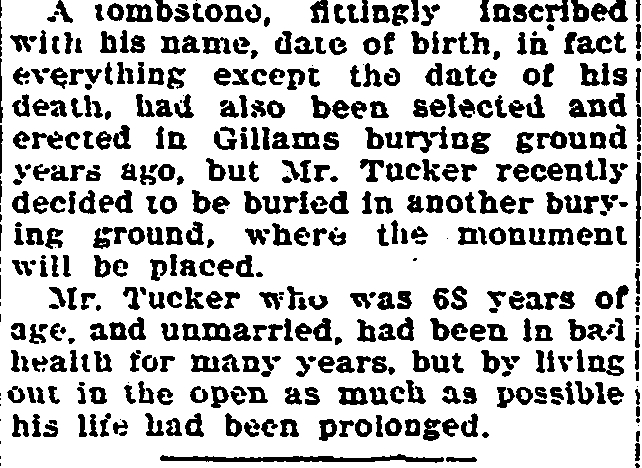 He died on the fifth of April 1927. 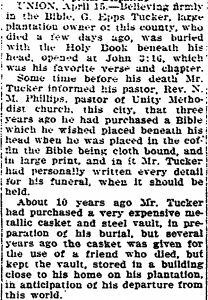 I still finding newspaper articles, wills, and property records which will lead me back to understand the relationships he had long ago. 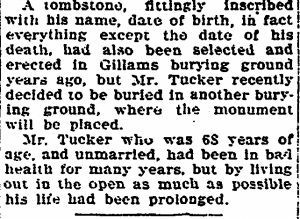 It was wonderful to find this obituary the Greensboro Daily Record, from Greensboro, North Carolina. It makes me wonder if the great grandson that traveled here was coming for more than the sweet potatoes he would load up and take back to Richmond, Virginia. We shall see. Family ties! I was astounded to also find that Charleston New and Courier had Carlisle obituaries. 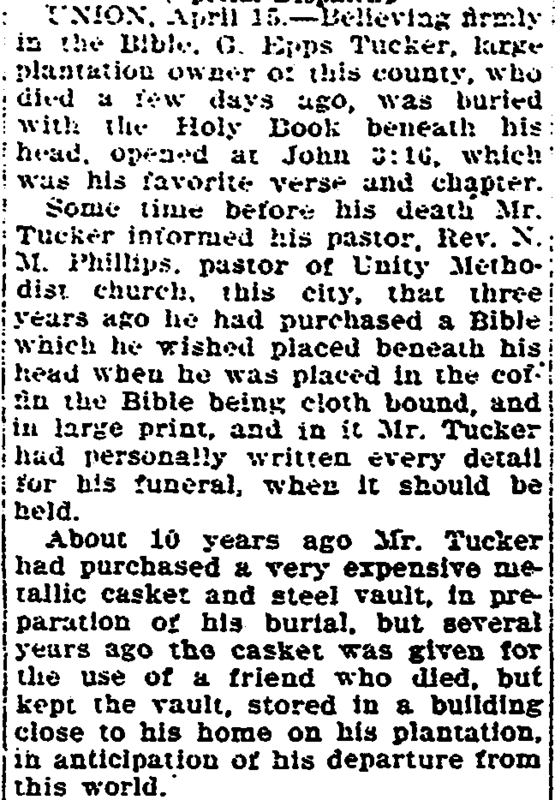 This is a very short obituary, but it gives the place of burial, Kelly’s Chapel. In addition to this, it tells us that Kelly’s Chapel is two miles below Carlisle. 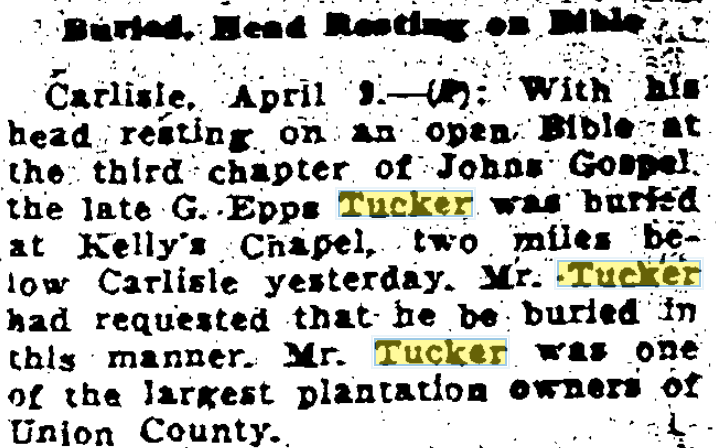 I also learned that Epps was one of Union’s largest plantation owners. I am grateful to GenealogyBank.com for these three records and others that I am finding. I have discovered a few more avenues of research that I can research back to tie in family and friends. I will be able to identify more of my family who until now have remained forgotten. If you have never used GenealogyBank.com or it has been a while since you have, perform a search for the name and area were where your ancestor lived to see if you get results. Then start your trial or subscription. Save a few articles in My Folder that are your family. Come and tell us that you have started in our Facebook Group so others might try too.